‘The Social World of Nottingham’s Historic Green Spaces’ is a community history project supported by the Arts and Humanities Research Council. 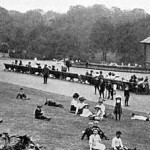 Municipal public parks, cemeteries and other public green spaces are one of the greatest legacies of Victorian Britain. 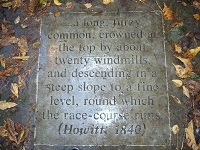 The 1845 Nottingham Enclosure Act enabled the creation of an interconnected series of green spaces including the Arboretum (1852) and the Forest. These constitute one of the most ambitious schemes of urban enclosure and improvement in mid-Victorian Britain and were inspired by local naturalists and sanitary reformers as well as cultural emulation and civic rivalry with other urban centres. Supported by the Arts and Humanities Research Council, this community history project aims to examine the changing social and cultural uses of the Forest, the Arboretum, the General Cemetery, Church Cemetery and some of the other green spaces formed during the mid-nineteenth century. Led by the University of Nottingham and the University of Derby and working with the Friends of the Forest, Friends of the Nottingham Arboretum, Nottingham City Council, Nottingham Women’s History Group and other partners, it is exploring the relationship between the parks and the changing communities in their vicinity. The project is directed by Professor John Beckett of the University of Nottingham and Dr. Paul Elliott of the University of Derby. The Research Fellows are: Dr. Judith Mills and Dr. Jonathan Coope.